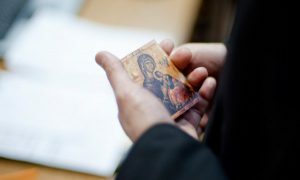 Many converts to Holy Orthodoxy have trouble making a personal connection with Mary, the Theotokos. They understand and accept the theology and the reasons why she is venerated and called upon for intercession, but on a personal, intimate or emotional level, there is not much connection. Part of the problem, I think, is that many have not come to an Orthodox understanding of nature/substance and person. Take a look again at the verse above from Matins of the feast for the Birth of the Mother of God. 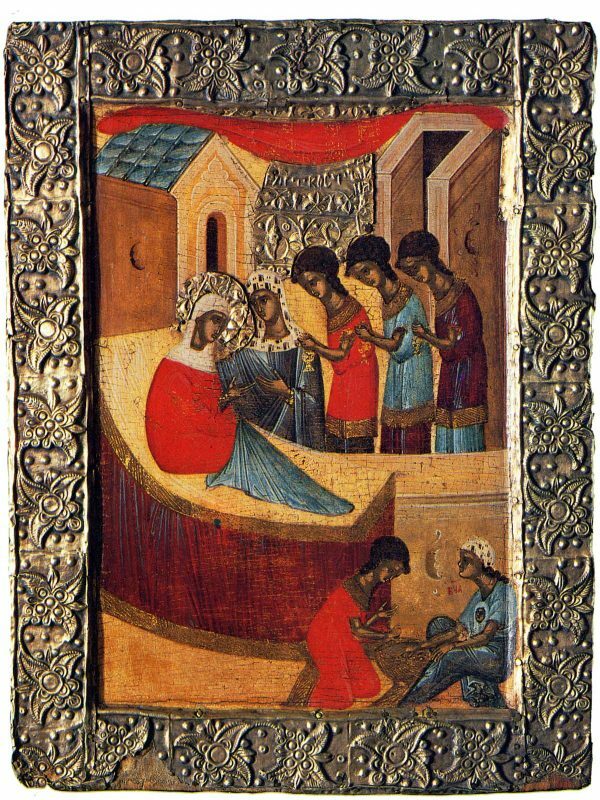 In the Incarnation, Christ takes on human nature/substance to be his “fleece” from the womb of a person: Mary, the daughter of Joachim and Anna.Christ didn’t pull human nature out of the air. He didn’t take on “general” humanity (as though such a thing could be imagined). He took the humanity of a particular, specific person: He clothed himself in the fleece that Mary’s womb offered. Notice that it was offered. 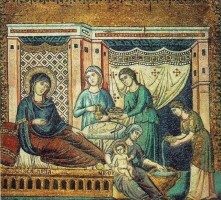 Mary participated in the incarnation not only in her biology but also in her intention. She offered herself to God and thus became worthy to bear God. God comes and dwells in those who invite Him, who offer their whole lives to Him. That is, God’s works among men are synergistic, works of cooperation: man’s (or woman’s) “yes” makes possible the works of God among men. Most especially the great work of salvation, the incarnation of the Word of God, was possible only through the “yes” of the daughter of Anne. And this woman, Mary the Theotokos, whose birth we celebrate today now stands at the right hand of Christ as his Mother and Bride where she continues to offer herself to her Son and Lord (see Psalm 44 LXX). 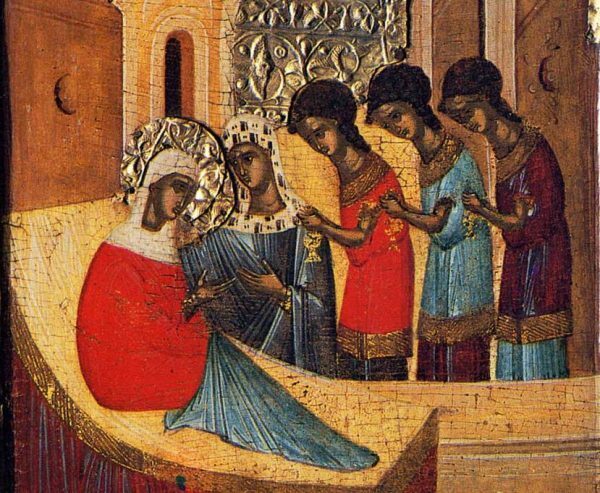 And here is a great mystery, in as much as each of us is in Christ, she too is our mother. Heaven is a crowded place. Somehow many western people imagine a heaven where they alone commune with God alone. This is more a description of hell than heaven (for hell is always described as a lonely place). Certainly the Bible and Church Tradition know of no such lonely heaven. The biblical language always likens heaven to a crowded place, like an imperial court, with ranks of angles and seas of people led by elders who are likened to judges and (especially in Old Testament images) to gods.But this heavenly court is not presented as a modern court of law, where impersonal law is supposed to reign supreme. Rather this is the court of the King of kings, the Son of God and the Son of Mary, a human and divine person who asks for advice (although he doesn’t need it—see 3 Kingdoms 22: 19-23, for example) and is moved by the intercessions of His fiends (Abraham and Moses, for example) and especially the intercessions of His Mother (see John 2, the wedding in Cana). When we pray, we do well to remember that we are presenting our selves before the heavenly court, not just the King, but the whole “cloud of witnesses” who have gone before us. And since this is not a court of law (except in the sense that the King is the Law), but the court of the King of kings who is willing to be entreated by His friends, we do well to get to know His friends, the Saints and most particularly his Mother, whose “yes” opened the door for the world’s salvation.